Side 1 printed with 2 PMS colors using heavy coverage. 12pt C1S White Semi-Gloss stock coated with Aqueous Matte. H3 business card slits on both pockets. Dark yellow accents on gray panels give Berding | Weil an industrial look that's well-suited to a construction law firm. 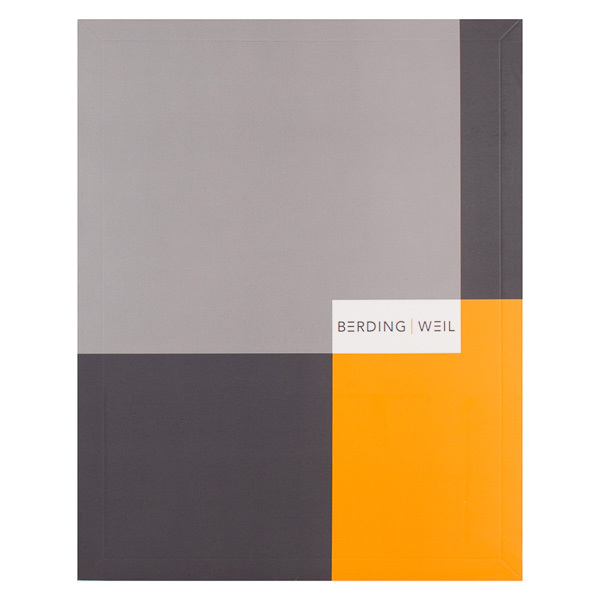 The blocks of light gray, charcoal, and yellow color create a big, bold pattern that mimics contemporary architecture; the white background for the Berding | Weil logo acts like a "window" into the brand's identity. The back mirrors the front, with the addition of contact info at the bottom. Four-color process printed on Side 1 of 130lb C2S White Dull stock. Coated with Aqueous Matte and spot BioPlus UV. Two sets of H4 business card slits on left pocket, with B1 brochure slit on right pocket. 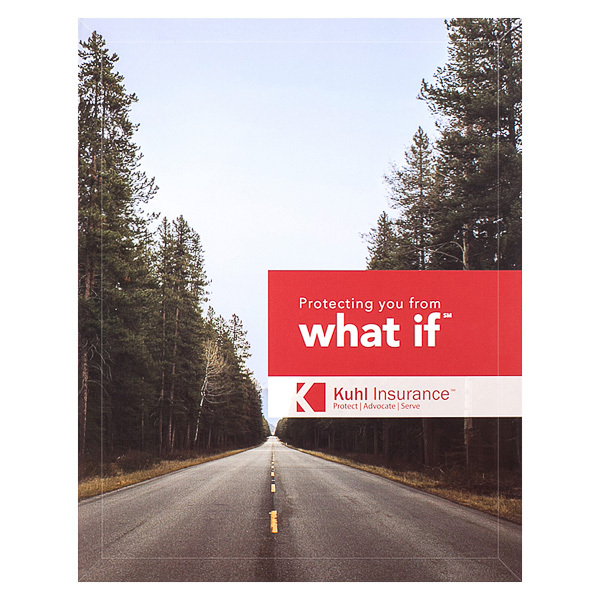 The prominent red box at right highlights Kuhl Insurance's logo and "Protecting you from what if" slogan. Pine trees loom over a deserted two-lane highway that stretches to the horizon, creating the ultimate "what if" scenario. Red pockets inside carry on the color branding, while the logo appears on the right pocket and the back cover. Also on the back, three images showcase Kuhl's commercial, employee, and personal insurance plans. Below, contact info helps clients reach an agent at a moment's notice. Four-color process printed on both sides of 130lb C2S White Dull stock. Coated with Aqueous Satin. H2 business card slits on right pocket. 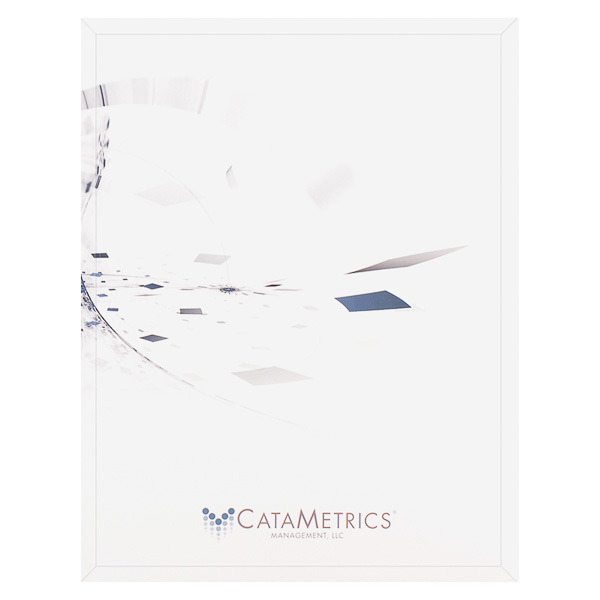 Exploding blue, white, and gray tiles across CataMetrics' cover design symbolize progress and action. White panels balance this sensation with a color that implies precision. At the bottom of the panel, the brand logo and name add stability to the organized chaos above. Blue interior panels move from light to dark, while boxes grow more pronounced toward the design's right side. At left, the brand slogan describes its services—with the box imagery alluding to each client's unique investments. The back cover is similar to the front, with added contact info. Side 1 printed with 3 PMS colors on uncoated 100lb Smooth White stock. H3 business card slits on right pocket. 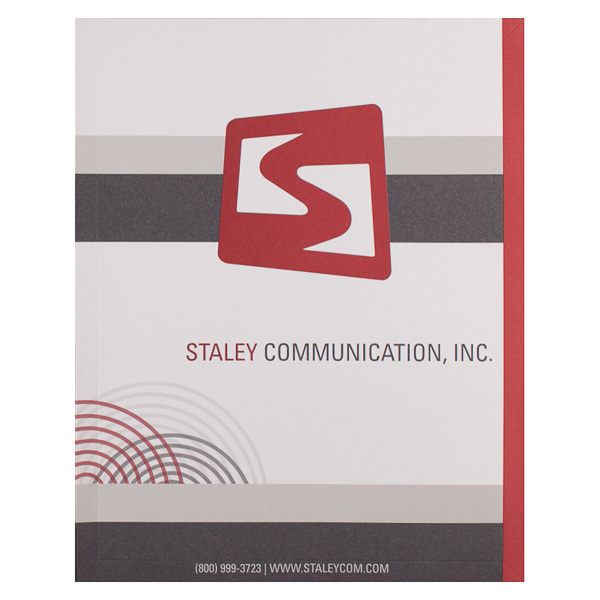 Staley Communication, Inc. promises a secure, strong connection, as represented by the red square in the logo. The wireless communication company uses a modern sans serif font for its name and contact information to keep the design clean. Various shades of gray and red exhibit bold, professional color branding. Half circles radiate from the bottom of the design, resembling a radio wave or cellular signal. Contact information is easy to find at the bottom of the cover. The back mirrors the front’s design, minus the logo and text. This adaptable product can hold enormous quantities of 8 1/2" x 11" print media with its patented Conformer® expansion technology. Expansion scores allow the two pockets to expand for a combined total of 3/4" storage space. This allows the pockets to comfortably hold thick materials like pamphlets, brochures, or even catalogues for a complete presentation packet, yet still permits the cover to lay flat when filled to capacity. When carrying just a few papers, the expansion scores resume an unbent position to ensure that the papers stay in place and that the product looks smooth and professional.